Seeds or plays on table. Once per game, downloads an FCA personnel; discard incident. OR Seeds or plays on table. Place on your FCA personnel. 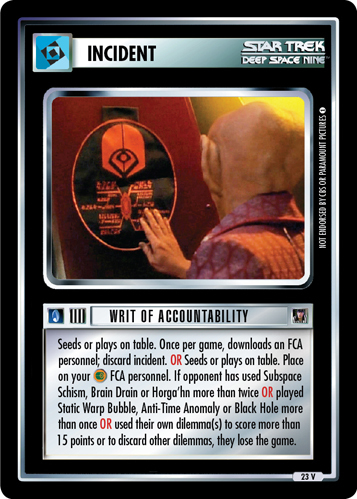 If opponent has used Subspace Schism, Brain Drain or Horga'hn more than twice OR played Static Warp Bubble, Anti-Time Anomaly or Black Hole more than once OR used their own dilemma(s) to score more than 15 points or to discard other dilemmas, they lose the game.